Product prices and availability are accurate as of 2019-04-16 16:12:13 UTC and are subject to change. Any price and availability information displayed on http://www.amazon.com/ at the time of purchase will apply to the purchase of this product. 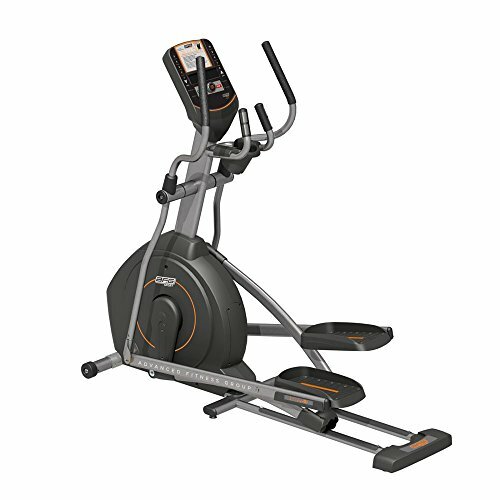 Look, feel, and live better with the AFG Sport 5.5AE Elliptical. Designed in conjunction with extensive biometric research, the unique 18 inch glide path and flat ellipse motion provide a natural stride that is noticeably stress-free on the hips, knees, and other troublesome joints. 10 levels of resistance and 43 programmed workouts accessible via LED screen mean you'll never grow bored of a stale workout regimen. Plus, oversized foot pedals, integrated cool-breeze fan, and an audio system with surround speakers and audio jack ensure the ultimate in comfort. Redefine the way you move with this sleek elliptical. Overlapping pedal rotation, flat ellipse motion, and 18 in. glide paths create fluid stride pattern. 43 workout programs and levels incorporated into easy-read 3-LED display. 10 levels of magnetic resistance and ergonomic, cushioned handlebars. Max weight of 275 lbs. . Accessories include cool-breeze fitness fan, and integrated audio system with surround speakers and audio jack. Assembled dimensions: 74L x 24W x 66H in..